Initially, I felt excited about writing this post. Even if you don’t need a short bio right now, writing one is a great exercise. You learn how to say more with fewer words. You learn how to position yourself and how to make a big impression from the get go. But last week, when I started preparing this post, I made a big mistake. I looked for inspiration on Twitter. If you try to explain a lot about yourself in a few words, you end up saying nothing. No personality. No big impression. No sense of connection. You sound the same as everyone else. So, I decided to look for inspiration elsewhere. How do fiction writers introduce their characters in a few words? I skimmed through the books I’ve read recently to look for powerful descriptions of people. If he were a dog, he’d have been a pit bull. How powerful is that comparison to a pit bull! In only 11 words, Krueger gives us a picture of an aggressive guy who’s persistent, too. It made me wonder, if I were a dog, what dog would I be? He was an Eagle Scout. Order of the Arrow. Member of Troop 135 out of St. Agnes Catholic Church. He had made himself capable in a hundred ways. He could start a fire with flint and steel; hit a bull’s-eye with a target arrow at thirty yards; tie a bowline, a sheepshank, a slipknot; lash together a bridge strong enough to bear the weight of several men. Why is this description powerful? Because the author focuses on one aspect of the person and he gives specific examples. The description is visual, so we can picture this guy sparking fires, tying knots and shooting arrows. The description may be a little long, but you can cut it easily by 50% and still make a strong first impression. Even in unflattering office light, Breanna McKenzie had the healthy glow of someone who jogged each morning, practised yoga with intent and deep-conditioned her glossy black ponytail religiously every Sunday. Three specific details (jogging, yoga, deep-conditioning her hair) help us visualize Breanne, and we can imagine how she glows even in the unflattering office light. Laura had been lost; hopelessly adrift. Kept afloat, but barely, by an unhappy combination of Prozac, Pinot Grigio and pretending things weren’t happening. Again, three specific details express a lot: Prozac, Pinot Grigio, and pretending things weren’t happening. The words even alliterate for extra flair. When you focus on one character trait or skill, you make a strong first impression and you invite readers to learn more. In contrast, if you try to say too much too quickly, a description of a person falls flat and nobody gets a feel of who they really are. Of course, the fiction examples above are different—you wouldn’t write about Prozac in a professional bio. But the principles of what makes a good bio remain the same. Choose what to tell and, even more importantly, what to leave out. You can’t cram your whole resume into one sentence. You have to be ruthless. Twitter bios, for instance, are so short, you can only communicate one or two things. That’s it. A Twitter bio is super short, and you can only make a strong impression if you choose carefully what to write. If you have three sentences, for instance for an author bio, then you can say a little more. But be careful, the same rule applies as with the one-sentence Twitter bio. Keep it short to make a strong first impression. Henneke Duistermaat is an irreverent writer on a mission to stamp out gobbledygook. Get your free 16-Part Snackable Writing Course for Busy People and learn how to enchant your readers and win more business. In three sentences, I explain what I do (writing), what I’m passionate about (stamping out gobbledygook), and I invite you to join my course so you can learn how to write more persuasively. Jessica Blanchard is a registered dietitian, longtime Ayurvedic practitioner, and yoga teacher. She’s on a mission to dispel dietary myths and make healthy habits accessible to everyone. Grab your free 7-Day Meal Plan at stopfeelingcrappy.com and feel healthier and fitter one bite at a time. Ry’s call to action isn’t very strong, but “More reclusive than J D Salinger on a rainy day” is a superb way to sketch a personality in a few words. 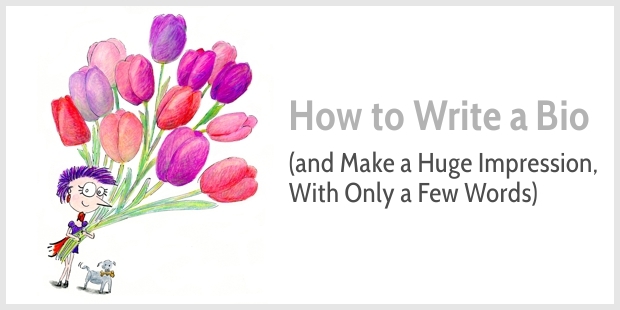 Want to make a big impression with only a few words? In short, communicate what makes you different, and tell clients what you can do for them. Because a professional bio is not only about you. It’s about your clients, too. Thanks for the info and the great examples here Henneke. I’ll be playing around with mine in the coming days. “Playing around” is a good phrase for writing a bio! I can’t remember how long I played around with mine, but it was weeks rather than days (and writing this post makes me wonder whether I have to revisit my Twitter bio again!). Happy playing, Lisa, and thank you for stopping by. Oh yes, I try to update my Twitter bio every month or so. Things change, you know? You are most welcome. Love your mugs by the way as I’ve seen them via Sue-Ann. ‘More reclusive than J D Salinger on a rainy day,’ >> yes! Jealous of that. And thanks for including me 😉 Interesting that the second sentence translates from 6 words in Dutch to 11 in English – usually it’s the other way round. Yes, I found it also weird that I ended up with more words. I somehow couldn’t make it shorter and it doesn’t feel as good as the Dutch version (probably because that one is shorter). Thank you for your lovely comment, Tony. A dash of creativity can definitely make a bio more captivating. Great tips and examples Henneke!! It’s awesome to see examples that are different from the norm. Love the visuals. You’ve inspired me to improve my byline. What do you reckon? Cynthia is a copywriter powered by chai lattes, rockclimbing, and remedial massages. She’s on a mission to draw out personable, reputable, small health and fitness businesses from the shadows. Grab her free guide on how to sound intelligent by writing in plain English. I like it. You can probably still improve the second sentence a little more. Try to find a stronger phrase than “draw out from the shadows”—something that sounds more positive, and reduce the number of adjectives as “personable, reputable, small health and fitness businesses” is quite a mouthful. Cynthia is a copywriter powered by chai lattes, rockclimbing, and remedial massages. She’s on a mission to help small health and fitness businesses connect with clients through writing that sticks in their reader’s minds. Grab her free guide on how to sound intelligent by writing in plain English. Yes, I like it. If you like, you can consider making your mission more specific to your audience. For instance: help small health and fitness businesses inspire their clients to lead a more healthy lifestyle. I like it! And Henneke’s suggestions. One of your best Henneke! I’ve long felt the same about “elevator speeches” — the reason they don’t work is we try to jam too much information into what should be a single thought-provoking nugget. Yep, I agree with you. The idea of elevator speeches makes me roll my eyes. But that’s silly because a good elevator speech is fab. As you say, you need just one thought-provoking nugget, something to connect with your audience. #Blogger & #copywriter for #software & #tech (esp #IoT). Loves #design, productivity & mindfulness. Newcastle upon Tyne. Ravenclaw. INTP. Chocoholic. Brilliant and not boring bios. That draw you in. I read your post not for my own bio actually but because I need help writing one and two sentence introductions for 40 – 50 historical puzzle pages. And it works for that! Where yesterday I was plodding through it like an elephant in quick sand this morning I’m inspired to have more fun with my project. Especially love the suggestion to use metaphors. That would make a whole blog on its own. Maybe you already have? Thank you for this post. It came just in time as I am currently trying to re-do my website about page and social profiles. Enamored with writing. I spin engaging stories about your brand so your clients don’t have to shop elsewhere. Just call me your Fairy Wordmother. Thank you so so much, Henneke. Great advice Henneke! I took notes and will check out some of your examples! You’re inspired me! Awesome post – and glad you said it took weeks to come up with your bio. These examples make it look easy. Writing so often looks easy, but we don’t see how much effort has gone into it. For me, the biggest challenge was to decide what I wanted to say. I was just starting out and I hadn’t figured out my positioning yet. Great post and I loved the examples you gave. I find writing bios very hard. I have this instinct to look at what others in my field are writing and try to find something that would work for me. It’s insane! I know it’s wrong, I know it’s useless and yet, I’m attracted to it. What’s with the copycatting? I have a strong identity, I know what I want and who I am. Why does it all go to smoke when writing things like bios on social media? I think most of us look at what others in our niche are doing, and there’s nothing wrong with trying to learn from others. I’ve found it’s often easier to look outside our own niche for inspiration. And out of all the different writing tasks, writing a bio is probably one of the most difficult. Play for a while, then let it simmer for a while, and then play a little more. Have fun! Thank you for stopping by, Elfin! Thanks, Henneke. I’m honoured to get a mention here – much appreciated! I hate it when all those letters, spaces and punctuation marks don’t amount to anything meaningful. It was rather demotivating to read through all those Twitter bios! For me the fight to find the perfect bio is unending…seems like I’m forever tweaking. Also, in my constant state of evolving (or is it experimenting?) I’ve taken to changing my bio for different places I publish! Oh Henneke, why can’t I just do one perfect one like you and it’s everywhere!!! Geez. P.S. But, don’t forget you need to add “illustrator” to yours!!! I don’t have one perfect bio either. I don’t think the perfect bio exist. Unless you’re Andy Murray whose Twitter bio simply says: “I play tennis.” How brilliant is that? Unfortunately, that doesn’t work for mere mortals like you and me. And you see … you already mention “illustrator,” but somehow it didn’t feel right. Also, I have a different bio on Instagram because I mainly share my drawings there. My Insta bio is: I play with words and colored pencils. Perfection doesn’t exist. Experimentation is what life is about, isn’t it? Ha ha! I always laugh at Murray’s twitter bio as it’s so deceptively simple yet at the same time understated. I like how he doesn’t feel the need to list out all his achievements. By the way, I missed my flight home from NYC in 2012 to see him win the US Open, which was amazing. Anyway, back on topic, trying to do a short About section for my new “personal branding photography” landing page. Trying to work in something like my “hobbit-like stature and tenacity”, along with being eco-friendly and helping businesses save time by creating images for their online content. It’s still a work in progress. Murray’s bio is brilliant. I love how understated it is. And lucky you for seeing him play (and win!) live! Thank you, Mohsin. Was there anything in particular you found valuable? To be honest, I skimmed your initial email the first time and, because my day is the usual crazy, didn’t click through initially. But I’m so glad I made the time to do it now. This was an absolutely genius post—and the examples were outstanding! I’ve added a note to do some brainstorming on my bio next week. As always, thank you for the inspiration and the easily digestible and actionable advice! Brilliant and enchanting as usual! Thanks for confirming how difficult it can be to engagingly summarize one’s life in two sentences. I get to put a short bio on most of the articles I write for magazines and I am so disappointed in the various versions I have come up with over the years. Now I see why, I conveniently left out my real personality. Shoot. Don’t beat yourself up over it, Thea. Most people leave their personality out of their bios. It IS a tough challenge. The short takes are never easy. How to sum up Hetty in 3 sentenceso ha! So…. Easy going until taken for granted. Lover of stationery, determined to be a success in business. Great start on your bio, Hetty. It makes me wonder what’s special about your notebooks and why are you passionate about them? Ooh! Henneke, I love this post. And who is Henrietta’s new friend? (or did I miss a post?) I love these smart, smooth, silky, bio’s and would love to add my own. I dream♡ This is my first attempt. Your comments would be sooooo valued. Thanks for all your gorgeous posts Henneke. You can probably take one step further with your bio, by defining the real benefit of what you do. You can find the real benefit by finishing the sentence: she helps you delete what no longer serves you and install what does, so ….. What is it your clients really want to achieve? I’ll keep playing with it. Now I’m thinking the Columbo piece sounds a bit ‘cheesy’. I’m not sure the Columbo reference adds a lot. I do like the phrase “reveal you to yourself.” I also like “make money as you grow your Lifestyle-Biz” as it’s a true benefit and it’s also specific to your audience. “Making a difference” is a little abstract. So, I’d be tempted to leave that out, or to make it more specific (but that might make it even longer). Hi Henneke – I hadn’t thought about writing my bio until I read your article. I’ll certainly follow your excellent advice when the time comes. I hope you’ll have fun writing your bio, Paul! Now this is powerful stuff Henneke and thanks to Lisa for sharing. My bio is not more than 2 sentences but this post just gives me a lot of meat. I’m glad you found it useful, Enstine! Thank you for stopping by. Henneke, this was very helpful. I always have trouble writing shorter than longer. Thanks. I find it hard, too. And it takes more time than writing longer! Henneke: Few weeks back, I came across your blog and book.. I not only like the content and but also the presentation style… I really enjoyed reading this article and response to the many comments. I drafted by first short Bio.. could you please review. I’m glad you enjoyed this blog post, Chandra. Great start on your bio! You may want to consider tightening it a little as you use the phrase “meditation” three times which is usually a sign that you can make it more concise. Also, what is the ultimate aim of your clients? Do they want to discover their SacredSpace or is their a deeper purpose? This depends on who you’re targeting. Thank you for a great article. I remember when I first came across your website (last year, I think), I was impressed with your bio and made a note to myself to use that as inspiration for mine. Of course that mental note was long forgotten! This time I’ve already made a first attempt for my social media profiles. I’ve been a longtime lurker, this is my first comment and is well overdue. Thank you, I can hands down say I learn and apply something useful from each of your articles. That is a lovely compliment. Thank you so much, Sonna. Helpful post, as always, but I really just wanted to say I love that drawing of Henrietta with the tulips, on a grey cold day like this it warms the brain. Not that I can complain about the greyness, NSW where I live is 100% in drought. I hope the clouds are not just teasing. Best wishes. Thank you for your lovely compliment on my drawing, Susan. That means a lot to me! I hope the rain will soon ease the drought. Succinct and thereby excellent, Henneke. Have to say that I’ve read words of many copywriters down through the years – some good, some not so, even if near-legendary. In my view your writing surpasses most. Please keep it up because I’ve learned more from your posts than I have from anyone else’s. Thanks. I like this. Always playing around with my Short bio for social platforms. What do you think of my twitter bio? @davidgcant Could be improved? Give it your best shot..
A risk savvy health and safety consultant extraordinaire. Cuts through the red tape (with a safety blade of course). I like it! I’d be tempted to shorten it a little: A health and safety consultant who cuts through the red tape (with a safety blade of course). That reads much better. I was thinking of replacing risk savvy with refreshingly practical. What do you think? Or is that too much? The idea of cutting through the red tape already indicates that you’re a practical person rather than a rigid you-must-follow-the-health-and-safety-bible type of person. So, I’d say adding “refreshingly practical” doesn’t really add anything new as you’re already telling me you’re practical—you understand client’s objections to health and safety, plus you have a sense of humor. Thank you so much, Henneke. Indeed, First impression last. Making an impressive bio needs to convey both professional status and personality in just one or two sentences which creates a great impact to the clients. I sometimes say or write too much and with no idea where I was going or how to make the points I wanted to make. It felt like I was writing in circles, as a result, I was saying nothing. Now I know what to do. Great tips, Henneke. I sometimes write in circles, too, as I don’t always know exactly what I want to say. The writing (even when it seems to lack purpose at first) somehow brings clarity. Marketer ExtraOrdinaire, like a stick of dynamite, I blow up old ways of doing things, bringing fresh ideas. The pink bunny can’t keep up with me. Really amazing content. You’re right a bio define a person and about their profession. So, it’s really important to write an awesome bio. I will surely use your tips to write a bio of my social media accounts.